Using a synth as large as this can often times result in the user forgetting that there is a world of very simple sounds waiting to be discovered that require none of the advanced features a lot of tutorials call for. This quick lesson in how to design an Absynth buzz bass is a great example of a big driving sound made in about a minute! Now, of course, the beauty of keeping sounds this simple is that they are quick to make and often times make life a little easier when it comes to mixing and mastering. There is also the added benefit of being able to use these sounds as jumping off points for future sounds. And one of my personal favorite benefits of keeping sounds simple, is that when you create something that sounds complex you can continue to push it to its limits for a lot longer than sounds that are complex at their core. This particular Absynth buzz bass is designed to be a harsh, distorted and driving force that is delivered in smooth fashion that dominates the music. A quick change in waveforms in the main oscillator changes it completely. And there are still endless buttons to push, knobs to turn and slider to move to make this sound your own. The Perform window is where you can change the Polyphony value to one, and Transpose the entire synth down just shy of two octaves. This creates a more focused sound, as the synth will not be spreading it out across multiple voices. Without reducing the Poly voicing, this sound will be quite terrible. This Absynth buzz bass is incredibly simple to make. 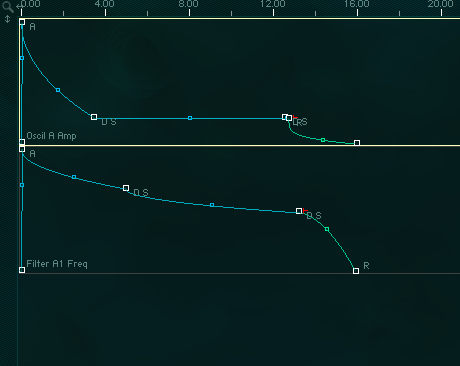 Begin by loading a Single Saw_smooth waveform, from the Simple Waves menu, into the Osc A module. (For a more modern sounding bass, you can increase the number of voices on the Uni tab.) This is then routed to a Lowpass 4 Pole filter, shaping the sound and adding some resonance. It then passes through a Supercomb filter which shapes the sound further and really enhances the edgy buzz character of the sound. The synth is then run through an effects module on the master output strip. A Waveshaper is loaded with a Square_fractal waveform and both the in and out Db level parameters have been adjusted to provide just the right amount of distortion for our Absynth buzz bass. As you can see below, there has been an envelope created to modulate the Frequency value of the Lowpass 4 Pole filter that we set up on the Patch window. This allows for the shifting in pitch filtering over time and as the sound is released. This is the heart of this Absynth buzz bass. If you want more or less phasing, more or less pitch bend in the release, etc simply begin re-shaping the envelope curves. Below is a quick audio sample of this Absynth buzz bass in action with some drums.